Meetings in Brussels on Monday involving British Prime Minister Theresa May, European Commission President Jean-Claude Juncker and European Council President Donald Tusk failed to produce an agreement that could open the door to trade talks in the Brexit negotiations. Key questions remain over future arrangements between the UK and Ireland. Why is the Irish question so important in Brexit talks? When the UK leaves the European Union in March 2019, the 500-kilometre frontier between Northern Ireland and the Republic of Ireland will become the UK’s only land border with the EU. The UK intends to leave the EU’s Single Market and Customs Union. This has implications for the future movement of people and goods across the frontier – as well as for the peace process after centuries of historical tensions. The UK and Ireland joined the EU at the same time, in 1973. Both countries and the EU have pledged to keep the Common Travel Area (CTA), a previous arrangement allowing the free movement of British and Irish citizens. However, after Brexit, Ireland will continue to allow free movement for EU citizens, raising questions over how future migration will be enforced. The movement of goods is important as the economies of both Northern Ireland and the Republic are highly integrated, with much free-flowing cross-border activity. The EU's external border normally means customs and regulatory checks. Ireland’s economy in particular is highly integrated with the UK’s. The 1998 Good Friday Agreement – seen as crucial in sealing peace after three decades of sectarian violence – assumed that both the UK and Ireland would be EU members. Many aspects of co-operation between the two countries are rooted in the deal. The UK’s departure from the EU raises questions over its future application. What solutions are the UK proposing? London has always wanted the Irish border question to be considered as part of future trade talks, arguing that they are inextricably linked. However the EU has remained firm in insisting that the issues be treated separately. The UK government published its position paper on Northern Ireland in August. It said there needed to be an “unprecedented solution” for the border, with no physical infrastructure or customs posts. The document contained proposals for specific arrangements, including “technology-based solutions”, to enable “as frictionless and seamless a border as possible”. It called for small and medium-sized businesses, which form the majority of Northern Irish firms, to be exempt from customs tariffs. For others, a “trusted trader” scheme could simplify customs procedures, potentially opening the way for import and export businesses to be declared online. A new EU-UK customs deal would enable the Irish border “to continue to be seamless” with “no customs border at all”, the paper said. 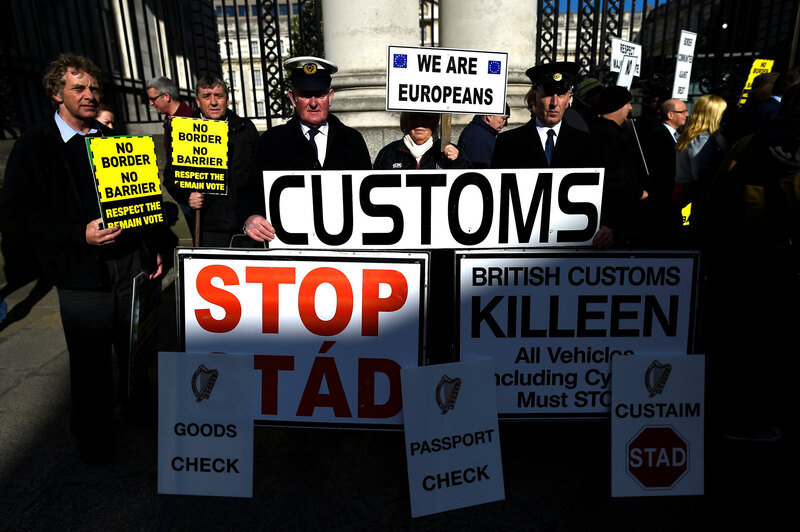 It dismissed the idea of a customs border in the Irish Sea as economically and constitutionally unviable. The paper also pledged to uphold the Good Friday Agreement, proposing to maintain funding for peace-related projects (PEACE) for their duration and encourage dialogue aimed at securing future arrangements. What have the Irish government and the EU said? The European Commission has argued that London should propose solutions to issues concerning Northern Ireland and the Republic, publishing a set of principles in September. “As it was the UK’s decision to leave the EU, it is the UK’s responsibility to come forward with solutions to overcome the challenges for the island of Ireland,” said the Commission’s Chief Negotiator Michel Barnier. Ireland’s Prime Minister Leo Varadkar wants a written assurance from London that the Good Friday Agreement will be protected and that there will be no hard border between the Republic and the North. He has publicly threatened to block Brexit talks from advancing to phase two unless Ireland’s concerns over the border are met. Dublin has also repeated demands for the UK to give assurances that there will be no “regulatory divergence”, “customs complications” or “customs divergence” between Northern Ireland and the Republic. It has denied that these amount to demands that Northern Ireland remain in the Single Market or Customs Union. However, it is clear that they would bind the UK into sticking tightly to existing arrangements – and imply some form of border instead between the islands of Ireland and the UK. Unionists in the North – upon whose support Theresa May’s government relies – and in mainland Britain have ruled out special status for Northern Ireland, and reject any moves that would loosen the North’s ties to the rest of the UK. Anti-Brexit campaigners protest outside Irish government buildings in Dublin, April 2017. The Irish government and EU sources said on Monday that negotiators were "very close to final agreement" on issues relating to Ireland that will ensure no future hard border. However, European Commission President Jean-Claude Juncker and British Prime Minister Theresa May said no deal had yet been struck. Reports from Brussels quoted a draft negotiating text, under which Britain and the EU would commit to "continued regulatory alignment" between Ireland and Northern Ireland after Brexit – a form of wording seen as potentially acceptable to all sides. However, the reports immediately brought a sceptical response from Northern Ireland's Democratic Unionist Party (DUP), upon whose parliamentary support the UK government depends. 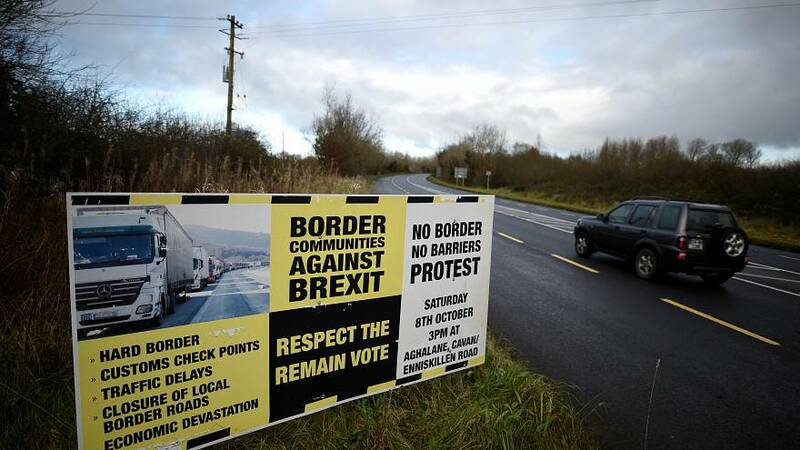 Reports last week said the UK government seemed ready to give new and more concrete assurances that there would be no hard border after Brexit. The accounts said that this would involve London devolving some powers to Northern Ireland to enable customs convergence with Ireland in areas such as agriculture and energy. This too was greeted coolly by the Democratic Unionists. They have said they are ready to withdraw support for Theresa May’s Conservatives if Northern Ireland is treated “differently” from the rest of the UK.